A BUBBLING CAULDRON: Mensinger Tosses Hat In Ring - Big Surprise! A few minutes ago the Daily Pilot online began carrying a story with the headline, "Mensinger Applies For Council", in which it tells the world what most of already knew was coming - that Planning Commissioner Steve Mensinger will be among those the City Council will choose from to replace out-going council member Katrina Foley when they meet on January 4th. Mensinger's candidacy means a total of 3 individuals have applied for Foley's seat. I'm told that Chris McEvoy will also apply later in the week. You can read the Pilot story HERE. You may recall that it was Mensinger that first put the bug in Foley's ear about running for the School Board. At the time I speculated he did that for purely personal reasons - to open up a seat for him without having to go through the bother of actually campaigning. He doesn't have to convince the electorate, only his pals. Here we are! This could be a 10 year seat - the last two years of Foley's term plus two four-year terms as an incumbent. Anyone who has watched Mensinger on the Planning Commission these past couple years know that he is seldom bothered by the details of an issue - he's a "big picture" kind of guy. In the article he tells us, "The only thing I think I'm good at is vision." Gee, Steve - no kidding! I've written many times about my perception of his willingness to bully applicants and, to some extent, staffers that appear before him. He is short on patience - not a particularly attractive character shortcoming for a potential council member. "GETS THINGS DONE" - BUT HOW? There is no question that Mensinger "gets things done". So did General Sherman in the Civil War - just ask the good folks in Georgia. I don't doubt that he would "get things done" as a council member. I do worry about the way he would go about doing it and the nature of the damage left in his wake. Regardless who the other candidates might be, I suspect Mensinger is the front- runner now. Based on his performance as recently as the Planning Commission meeting last night, that should make the residents of this city more than a little nervous. Oh lord talk about the bully pulpit. I get the feeling if anyone pops off to the council that Mesinger will take them outside and kick the you know what out of em. I say run for the hills. Cauldron, this is DONE. It's pretty clear it has been Mensinger all along. Get rid of Foley and the seat is yours. I think it sets a dangerous precedent. The whole process is tainted. McEvoy should not even bother applying. Mensinger will be the next Councilmember, you just watch! Could well be... Last night he practically asked Tom Hatch to step outside! Actually, he DID ask him to step outside - and go to Lions Park with him after the meeting! An O.C. sheriff's volunteer allegedly misrepresented himself and said he could have a baggage attendant fired. An Orange County businessman and political ally of Sheriff Michael S. Carona allegedly misrepresented himself as a deputy sheriff to an airline employee during a dispute that began after he returned from a hunting trip and found his baggage — including his guns and game meat — were missing. Stephen Mensinger, who has no police powers but is authorized to carry a badge as a civilian volunteer reserve, allegedly referred to the Alaska Airline attendant as a "dumb blond," snapped pictures of her with his cellphone and said he could have her fired. There is one good thing about Mensinger...he does have a fantastic wife, and 2 amazing sons. honeyman, that's our guy - always willing to throw his weight around. That could be the future of city council/resident relations. Sebastian, I never said he was a bad father and husband, just that he's dictatorial in his style and a bully. I guess it's all a matter of style and perspective. Unlike you, I actually like Mensinger's style and no nonsense approach to important matters. For whatever it's worth, my husband and I both think Steve would make a super addition to our city council. We also like Jim Fitzpatrick and Jim Righeimer and we can't figure out why you detest these men so much. All of them are highly respected citizens of this community. Other people seem to like them just fine. Gail, I DO NOT detest those three guys... Each of them have resumes that should bring valuable life experience to a commission and/or council position. I suspect each are wonderful family men, devoted to their wives and children. I've never said otherwise. However, this is about their style - the "how they do" more than "what they do". I don't want our city to be represented by a bunch of guys who play fast and loose with the Brown Act because it's inconvenient and who try to muscle things through because they have a seat at the big table. I don't like it when I see them bully applicants and staffers. You can't really tell me truthfully that behavior is OK with you, can you? Really? Yeah, I also want smart folks on the dais that can get things done - but not at any cost. Thanks for your perspective. Which of those you mentioned did Mr. Mesinger bring up? Was it Mcevoys renting or reckless driving arrest? I think you're unfairly putting words in his mouth that were never spoken. But that doesnt matter to you does it? Mcevoy shouldn't bother applying he's a loud mouth and not good for the city. Good catch! I remember that story but didn't relate the name. Hopefully he learns to cool that temper. At this time, with Improvers running rampant over the city, there needs to be a special election. Wendy can't stop them on her own. Gail, it's clear your allegiances lie with Mr. Mensinger. Since you raised the issues with Chris and his arrest, answer the simple question: Is Steve Mensinger currently employed? Our good friend lives on his street and says he sees him at all hours of the day in jeans and a football shirt coming and going. Mensinger and Hatch discussed the homeless problem in a very civil manner last night. Their respective views of the park situation differed, but it's rare for two people to agree on anything these days. The most important thing is that a Homeless Task Force will be formed to study the problem and resolve their differences. I honestly can't think of a better first step to take. Tim, I really couldn't care less what Mensinger does for a living. He's probably going consulting out of his home like I've done for the past 20 plus years. I prefer to work in comfortable clothes when I don't have to be in a client's office. It's likely that's what your friend is observing. It's what Steve Mensinger does on commission or council time that affects ME. As for Katrina Foley, she is far more valuable to ME on the school board, than on the city council. My children are more important to me than anything else. You see, perspective is everything and people tend to be self-centered. Sorry, but I'm undoubtedly guilty of that. Honeyman, I really don't care what Mensinger does on his own time, as long as it doesn't hurt anybody. Your airport article clearly indicates he was the victim in a possible theft of his personal property. It looks to me like he had a right to be mad. Gail, the point of referencing the airline article is to show the character of the man; not that he got mad, righteous or not, not that he made idea threats to a person that was attempting to help he with is problem, not that he used sexists slurs dealing with that person, Gail he lied, lied without consideration of the consequences. Does he lie only when he is upset? Does he lie only at times when the ends justify the means; when he make comments on the dais, let's say about how he did research on a specific issue or studied that issue thoroughly; or that he spoke to hundreds of Costa Mesaians and came to a consensus to vote one way or another; or that he has never discussed issues and how they will be voted on, with other council members prior to a public hearing. Everything a public official says, every action they make, goes to character... and that does matter to me. Fitzpatrick a great guy?? Bahahahaha. He is the Ed Lillywhite Norton of the planning commission. Fitzpatrick has already shown is eagerness to be the attack dog for Riggy and Mesinger. He was right beside Beaver at the now infamous "stinkeye" incident. And just who is Fitzpatrick anyways and I think he lacks any qualifications for being on the PC. He is a car washer for gods sake. And he certainly is not cut out to be on the council. This is the saddest display of croynism ever in Costa Mesa politics. Mesinger and Riggy are angry men and you can bet they are going after people ASAP. Sad day for CM. Sad Day. OK, let's see if we can agree on a few things here. First, according to reports from his friends, Steve Mensinger is a wonderful neighbor, father and husband. I have absolutely no reason to challenge those opinions. Second, he's a man full of energy and should get credit for pulling youth football in Costa Mesa up by it's bootstraps. Kudos to him for that. Third, he's been a successful businessman and probably made a ton of money while working for Ambassador George Argyros at Arnel. He may have made a few bucks while the President of a division of SunCal Companies before it went bankrupt. I don't care too much that he might not be working right now - he's sure not alone in that predicament. I think you're going to have to give me some slack on the other side of the ledger, though. Fourth, based on the news articles linked above, he has publicly demonstrated some problems with a temper and abuse of authority. Fifth, without question he has abused applicants before the Planning Commission during his tenure. Sixth, he admits that his only attribute is that he's a guy with "vision", which is certainly reinforced by his apparent reluctance to involve himself with the details of an issue. Seventh, it looks as though his scheme to convince Katrina Foley to run for school board to free up a seat for himself has worked. Eighth, while I have no specific evidence that he has violated the Brown Act, his personal friendship with Jim Righeimer and his recent acquisition of Jim Fitzpatrick as a barnacle on his bottom certainly have created opportunities for violations. 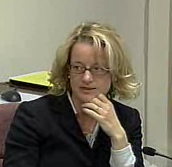 During the last Planning Commission meeting he and Colin McCarthy whispered back and forth behind Vice Chair Clark's back during the meeting - behavior that is curious and questionable. "Gail, it's clear your allegiances lie with Mr. Mensinger. Since you raised the issues with Chris and his arrest, answer the simple question: Is Steve Mensinger currently employed?" How do these even relate? How about you go ask him rather than skulk around the internet spreading gossip? I'm not going to drop it. Which of those you mentioned did Mr. Mesinger bring up? Was it Mcevoys renting or reckless driving arrest? I think you're unfairly putting words in his mouth that were never spoken to suit your own agenda. The city may come out in droves on the special CC election night against Mensinger, as they came out FOR Wendy. The boys wont hear a word. The three amigo's already have the results sealed and stamped in approval of Mensinger. My prayers are with Wendy!